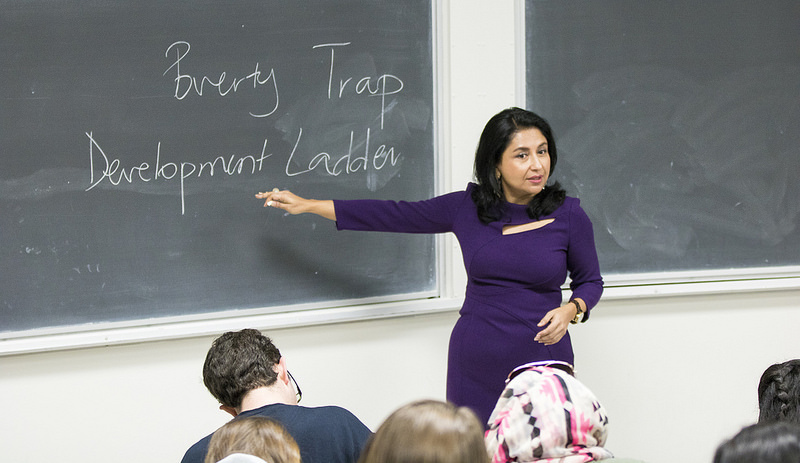 Ananya Roy, Director of Institute on Inequality and Democracy, teaches a class about poverty. On day one of teaching her first UCLA undergraduate course, “Democracy and Inequality,” award-winning scholar, author and teacher Ananya Roy wasted no time getting right to a key point. Roy wanted to convey to students that “unprecedented forms of income inequality currently afoot in the United States have been produced through policies,” including taxation. Roy describes her course, open to undergrads and grad students, as “taking up the case of persistent inequality in liberal democracies,” as well as covering key frameworks and methodologies for understanding and analyzing poverty and inequality. In doing so, she says that the already very popular course examines forms of action — from the role of government to social movements — that seek to intervene in such problems. “It is important for us to recognize that various forms of inequality, be it income inequality or racial inequality, have been constructed and maintained,” said Roy, who joined UCLA in 2015 after many years on the faculty at UC Berkeley. And, her own discipline is not free of culpability, according to Roy. Urban planning, she said, is also “complicit in the production of racial inequality,” citing redlining and other forms of spatial segregation as examples. At UC Berkeley, Roy held the Distinguished Chair in Global Poverty and Practice. Her course on global poverty regularly drew hundreds of undergrads each year, and, in 2010, The New Yorker called the advocate of public higher education “one of Berkeley’s star teachers.” The dynamic instructor, who also uses social media to encourage her students to think about their participation in public debate, also earned the Distinguished Teaching Award, the university’s highest faculty teaching honor, and the Distinguished Faculty Mentorship Award. Roy recently joined an international group of scholars as the co-editor of the International Journal of Urban and Regional Research (IJURR), published by Wiley-Blackwell. In addition to teaching as a professor of Urban Planning and Social Welfare at the UCLA Luskin School of Public Affairs, Roy will serve as the inaugural director of the new Institute on Inequality and Democracy at UCLA Luskin. The center will be launched with two days of events, Feb. 4-5. Roy has an ambitious — and still developing — task at UCLA, Luskin and the wider community. At the new institute, based within the Luskin School, she will oversee a multifaceted program of research, training and public scholarship concerned with both the current moment of inequality as well long histories of oppression and marginalization. With research interests ranging from social theory to comparative urban studies, Roy has dedicated much of her scholarship to understanding and analyzing persistent poverty in a prosperous but unequal world. “The institute’s work is just getting started,” said Roy, but it will be quite different from similar centers and institutes at other universities. Key themes of the institute will be racial justice — and not only in economic terms — and thinking across the global north and south as opposed to focusing only on the U.S. or other countries. And, while the center will seek to “move the policy needle,” Roy said social movements will provide a guide as to how such change can take place. Another goal of the center is to create a space for debate. “I think the point we want to make is that it is necessary to have an intellectual space for debate within the left, within progressive and radical thought and action,” Roy said. “We hope the institute will be such a space. And Los Angeles is the ideal setting for such ambitions. Born in Calcutta, India, Ananya Roy earned her bachelor’s degree at Mills College in Oakland, California, and her master’s and doctoral degrees at UC Berkeley. At UCLA Luskin, Roy holds the Meyer and Renee Luskin Chair in Inequality and Democracy and faculty appointments in Urban Planning and Social Welfare.